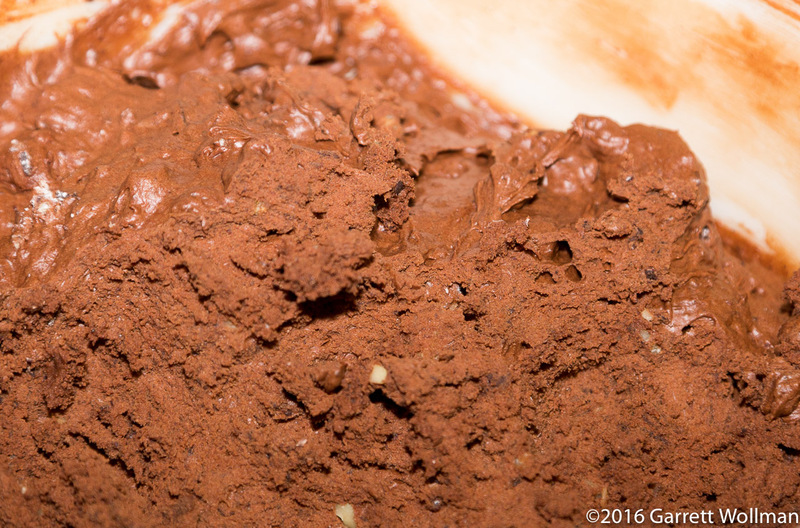 Unlike most chocolate cookies, these are made with melted chocolate rather than cocoa, and in fact there’s quite a lot of it. There’s nearly a pound in total, both bittersweet and unsweetened, some of which is melted, and some of which is added to the dough in solid form. Here we have the first mise, which consists of four ounces (112 g) of unsalted butter, another 4 oz of chopped unsweetened chocolate (I used Callebaut, because I could get it in a reasonable-sized block at my local Whole Foods), and 5 oz (140 g) of chopped bittersweet chocolate (here, Valrhona Guanaja 70% — I’m pretty sure Chang uses TCHO in her bakeries). 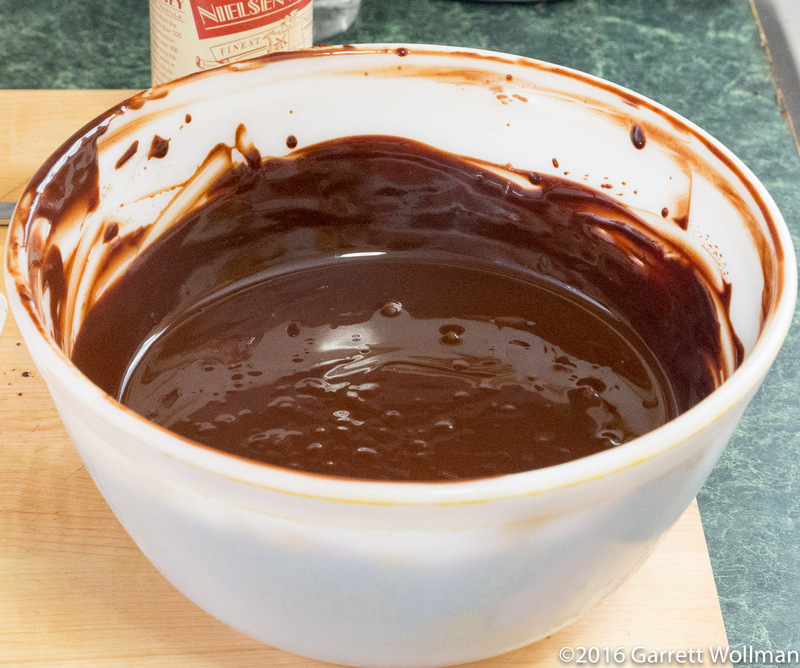 The vanilla extract will be added to the melted chocolate later. 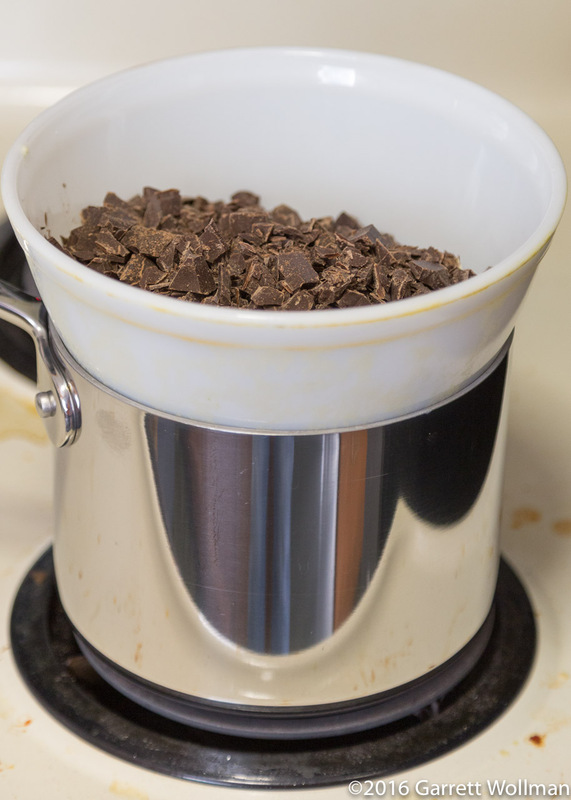 Once the chocolate and butter have melted together and are completely smooth, the mixture is removed from the heat, and a half-teaspoon of vanilla is stirred in — then it has to cool in the refrigerator for half an hour. 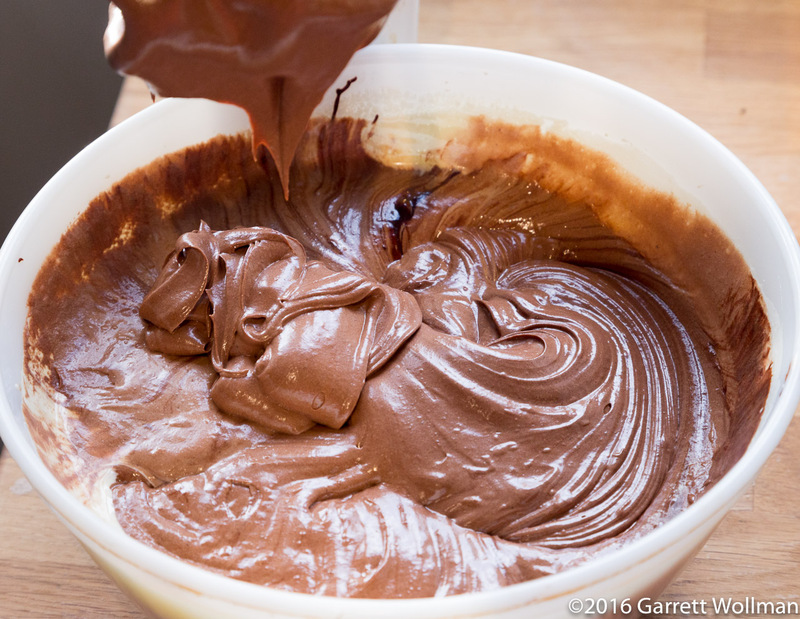 During the cooling process, the fat may resolidify, especially around the edges of the bowl; I didn’t do this, but it might be a good idea to whisk the mixture once or twice while it’s in the fridge to keep this from happening. Now the remaining ingredients are assembled. Clockwise from upper left: the cooled butter-chocolate mixture; 4 oz (112 g) of the same bittersweet chocolate, chopped into approximately ½ in (1 cm) chunks; four eggs; 300 g granulated sugar; 70 g all-purpose flour; 75 g chopped toasted walnuts; ¼ tsp espresso powder; ½ tsp each kosher salt, baking soda, and cream of tartar; and finally, 2 oz (56 g) of shaved unsweetened chocolate. Like with some brownie batters, this cookie dough is based on a whole-egg foam, stabilized with sugar to the “ribbon stage”. 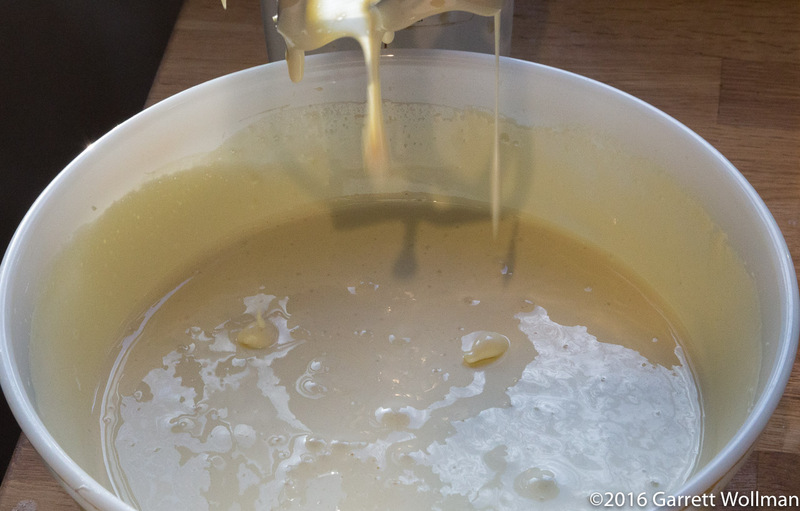 Here I’ve used a hand mixer to beat the eggs and sugar for about ten minutes; it takes less time in a stand mixer using the paddle attachment. After beating the cool butter-chocolate mixture into the egg-sugar mixture at low speed, it’s already quite thick, despite no flour having yet been added. It will only get thicker in the next stage. I used the hand mixer to beat the eggs, rather than my stand mixer, specifically in anticipation of having to fold in the dry ingredients (all of which have been stirred together previously): my stand mixer’s bowl is so deep it’s very difficult to fold in dry ingredients at all, and especially difficult to ensure that all of the wet ingredients are scraped off the bottom of the bowl, where there is a large divot — no such problem with the plain Pyrex mixing bowl I’m using here. Now that all the ingredients are just incorporated, this is less of a batter than a (fairly stiff) dough — and it will get even stiffer after it spends the recommended three to twenty-four hours, tightly covered, in the refrigerator. The dough having rested, I scooped it out onto cookie sheets that I covered with sheets of baker’s parchment. The recipe gives a yield of 15 cookies using quarter-cup (60 ml) measures; I’ve previously had issues with the cookie recipes in this book calling for much too large a measure, so I departed from the recipe by using a #30 disher (32 ml) instead. This gave me nearly twice as many cookies (I got 28, counting the dough that I ate unbaked), and the results were only slightly smaller than what you can buy at Flour. Perhaps a #24 disher (40 ml) would have been spot on, giving cookies about 25% larger. The cookies are baked in a 350°F (175°C) oven for a fairly long 15 minutes — I found that Chang’s timing was perfectly accurate for the desired doneness despite my portions being smaller than specified in the recipe. You can really see how much this dough has set up after hours in the fridge. I found it necessary to keep a glass of hot tap water handy to heat up my disher and clean off the dough that stuck to it after every six or eight cookies. 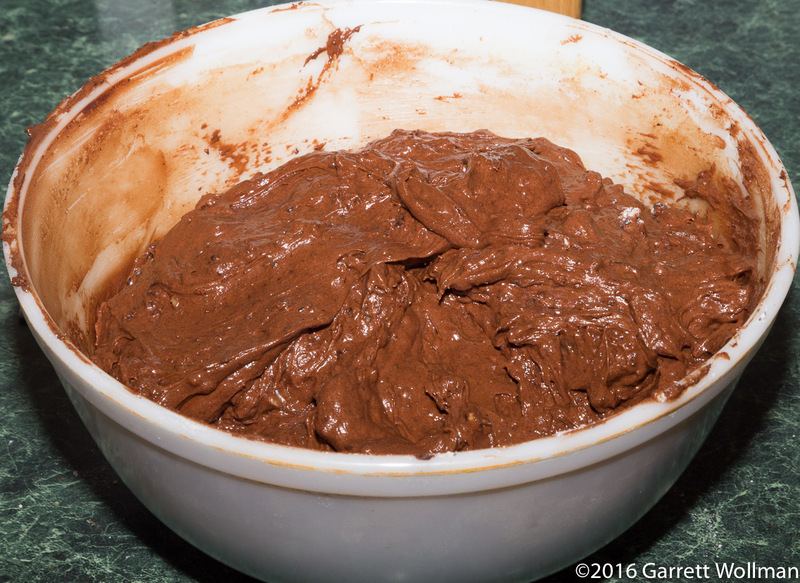 I also found it difficult to resist just eating raw blobs of dough straight out of the bowl…. This recipe really requires two cooling racks. After baking, the cookies cool on the pan for ten minutes, quite a long time by the standards of my cookie baking, with the pan sitting on one rack; then they are solid enough to be transferred with a spatula to a separate cooling rack to finish cooling. You can see in these cookies there are a few spots where a chocolate chunk was directly exposed to the heat of the oven and melted completely; those cookies were still delicious. 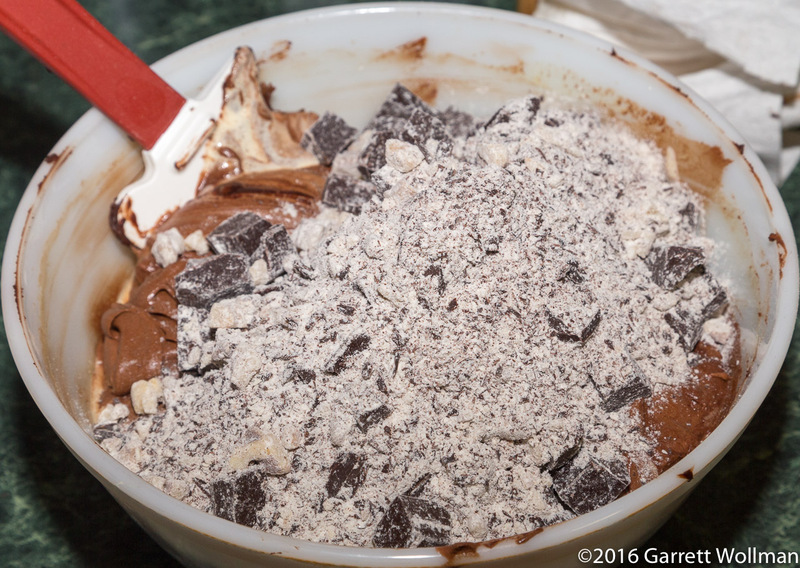 Gallery | This entry was posted in Food and tagged chocolate, cookies, Flour, Joanne Chang, recipe. Bookmark the permalink. Omg! These look like little round brownies! Thanks for sharing.